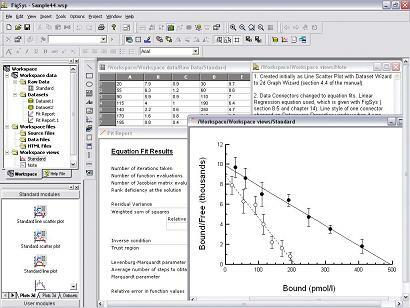 FigSys v.2.4 is a program for processing, analyzing and presenting data and creating science documents of all kinds. FigSys is a major advance in Windows graphics software. It is powerful but easily accessible to users of all levels of experience. Turning your data into basic figure types such as line graphs, bar charts, areagrams, drop-plots or scatter diagrams is completely automatic and there are endless refinements which can be added with the simple-to-use tools. Text-only charts can be created and 3D data graphing is also included. FigSys has advanced spreadsheet and word-processing power and entire reports and posters can be created without using other software. However, the program is easily interfaced with other software and can import and export data and images from/to a variety of sources. Data processing is comprehensive with many transforms and statistics supplied. FigSys has powerful multivariable equation-fitting which includes a unique genetic algorithm for creating accurate initial parameter estimates. Many standard equations are supplied and you can easily add your own in conventional algebra. There is also a 'freehand' curve facility which enables you to insert smooth graph lines exactly where your eye tells you they should be. Presentation quality output can be made to all Windows-supported devices such as printers and slide-makers and also to a wide variety of image formats for transfer to word-processors, slide bureaus etc. Template facilities in FigSys let you use a similar design of figure repeatedly with different datasets. Zoom and snap-to-grid features enable precise positioning of all the components in your document. You can reprogram the toolbars to suit your own style of working. The feature-set of FigSys can optionally be controlled by your own scripts. Click here for a list of FigSys features.